Veterinary clinical medicine professor Dr. Jason Pieper, a veterinary dermatologist, sees patients with antibiotic-resistant bacterial infections nearly every day on the job. 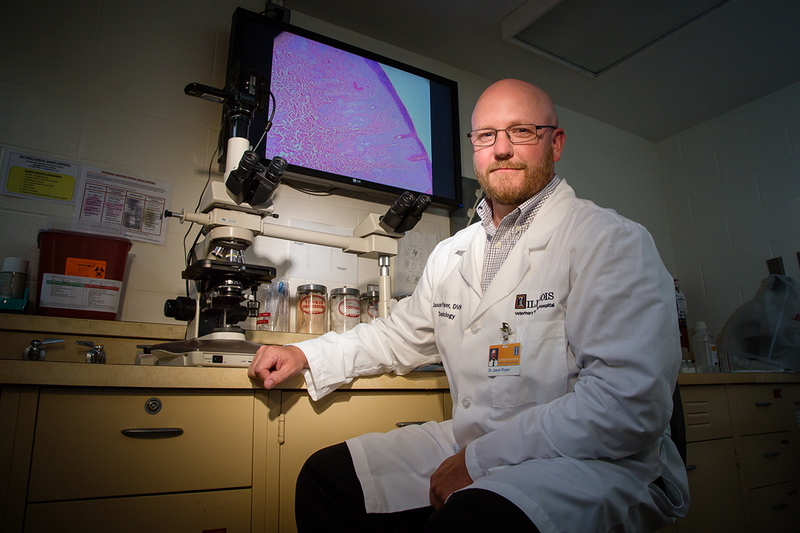 Nearly every day on the job, veterinary clinical medicine professor Dr. Jason Pieper, a veterinary dermatologist, sees antibiotic-resistant bacterial infections in cats, dogs and other pets. This is not just a local phenomenon; nationally, rates of antibiotic-resistant infections in companion animals are rising at an alarming rate. Pieper spoke to News Bureau life sciences editor Diana Yates about what he sees and what can be done about it. How often do you see antibiotic-resistant bacterial infections in your patients at the Small Animal Clinic in Urbana? Yesterday, we had three animal patients with methicillin-resistant Staphylococcus pseudintermedius, a type of bacteria that colonizes the skin of dogs and cats. Today, we have one. If you averaged it out over time, every day in the clinic we’re seeing about one case of methicillin-resistant S. pseudintermedius. There also are other types of antibiotic-resistant infections in pets. A difficult one that we commonly deal with is Pseudomonas ear infections. Antibiotic-resistant E. coli, Enterococcus species and salmonella also have been identified with an increased prevalence in the gastrointestinal and urinary tracts. Some of these bacteria may be causing infection in the animals, while others may just be present with no problems noted. Do we know how widespread such infections are in animals nationally? Globally? Since the original identification of methicillin-resistant staphylococcus as a rapidly emerging pathogen in 1999, it has increased in significance worldwide. Reports on the true prevalence vary. Methicillin-resistant staphylococcus infection in animals has a reported prevalence of up to 40 percent in North America, 20 percent in Europe, 48 percent in China and 12 percent in Australia. How does this compare with antibiotic-resistant infections in human populations? Currently, about 25 percent of human Staphylococcus aureus infections are methicillin-resistant. This has decreased by about 50 percent in recent years, but still affects more than 80,000 people per year. What do you think is contributing to the problem in pets? I think a big problem is people giving antibiotics to animals when it’s not indicated, when it’s not necessary. If your patient is going into surgery and there’s a huge risk, then it’s prudent to give antibiotics. But in other circumstances, it’s better not to. I take skin biopsies all the time and in my seven years of doing them, I never give antibiotics unless there’s infection prior to my taking a sample. I have yet to have a biopsy site come back infected. I think a lot of people who take biopsies always give antibiotics, no matter what. Those practices need to change, to decrease the chance of resistance. Studies have shown that giving animals antibiotics for only a week or two can induce antibiotic resistance. When we decide to give antibiotics, we do so for no less than 21 days. The other issue is that veterinarians are giving their patients more powerful antibiotics than are appropriate. Some of the more potent or broader-spectrum antibiotics induce mutations in the bacteria that spur resistance and cause more problems. How do you treat antibiotic-resistant infections? In some cases, we do use the “big gun” antibiotics, which are less than ideal for reasons already mentioned and because they can damage the liver and kidneys. I'm dealing with one dog that has a liver issue right now from an antibiotic I used because its infection was not responding to other treatments, including antibiotics. I had cultured the wound and tested the bacteria’s sensitivity to the drug before determining which antibiotic to use. A different approach is to use extremely aggressive topical antiseptics that are applied during bathing or as sprays, mousses or creams. These have to be applied to the affected areas up to two or three times a day, and sometimes help clear up infections without having to resort to using antibiotics. Are any of these infections a threat to human health? There is always a chance that methicillin-resistant S. pseudintermedius could infect humans, but the chances are very low. S. aureus tends to live on humans and infect humans, while S. pseudintermedius tends to live on and infect dogs and cats. There are always outliers and rare instances when bacteria cross over to another species. S. pseudintermedius typically infects humans when they are immunosuppressed or bitten by a dog or cat, since the mouth is a common site for the bacteria. We have decreased the incidence of methicillin-resistant bacterial infections in people largely by using antibiotics more responsibly. I remember a time when I would always be prescribed antibiotics for the flu. Now, physicians are not prescribing antibiotics for viral infections, which don’t respond to antibiotics. I feel the veterinary community needs to take a lesson from this and also start practicing the responsible use of antibiotics. If an animal’s skin is inflamed, test the site to determine whether antibiotics are needed. I see way too many cases where such tests are not performed and the doctors give out antibiotics no matter what. This is perpetuating the problem. At the same time, all pet owners should question veterinarians whenever they prescribe antibiotics without first confirming a bacterial infection. Editor’s note: To contact Jason Pieper, email jpieper@illinois.edu.